April supports Document Freedom Day, which will be held on 25 March 2015. The Day's aim is to remind people of the importance of having truly open document formats. Such formats allow citizens, consumers, governments and companies to use the software of their choice while retaining long-term control over their documents and their data. For the 2015 edition, we encourage everyone to educate as many people as possible to the importance of open standards, citizens as well as public officials. In order to do so, you can for instance, inform public authorities about the issues related to the use of closed formats to interact with their citizens. A notable example is fill-in forms that require the use of proprietary tools. This particular example causes numerous issues for Free Software users when interacting with local authorities. 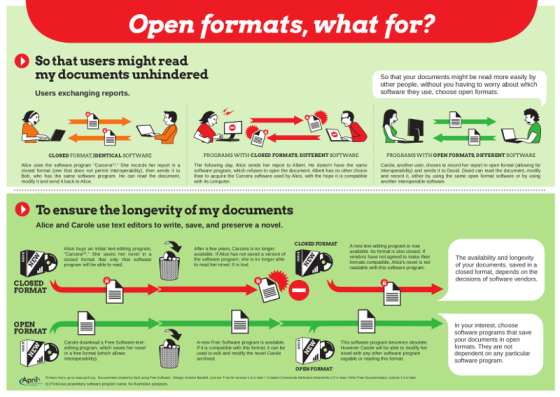 You can also inform and talk about the importance of open formats and interoperability for citizens by sharing April's information document "Open Formats, what for?". You can also invent your own ways of informing people, and you can send us examples or your actions in favor of generalising the use of open standards and interoperability. In order to know more about Document Freedom Day, you can visit their website.